• GDC &apos;10 day two is done and the Indie Gamemaker Rant! session was pretty damn tight, especially with games journalists Brandon Boyer (Edge, etc.) and Ryan O&apos;Donnell (Area 5 Media) decrying the current state of the industry&apos;s media coverage. Their main points were to start treating all games equally (e.g., iBailout!! gets the same kind of consideration as Uncharted 2 [I&apos;m sold!]) and that writers need to drop the attitude and have some damn respect for the people and games that pay their bills (again, sold—I&apos;m doing my best here, fellas). • Earlier in the day and also at the Indie Games Summit, Alec Holowka (Aquaria, Marian) argued—thoroughly convincingly, I might add—that games should never be judged in parts (i.e., Graphics = 8/10, Gameplay = 9/10), but only considered as a single cohesive work, the same as any other consumable medium. Sold again! • The GAMMA IV one-button experimental gameplay party was a good time for all—and especially be on the lookout for B.U.T.T.O.N. (Brutally Unfair Tactics Totally OK Now), by Copenhagen Game Collective, the soon-to-be party smash hit of the century. 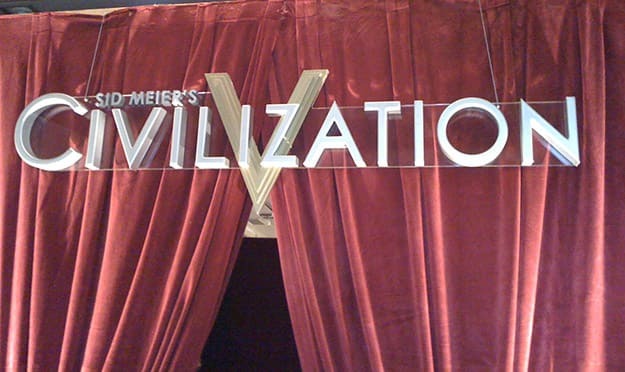 • Oh, and 2K Games&apos; Sid Meier&apos;s Civilization V, with a crispy new graphics engine, ranged combat, and more cool new stuff, is looking really nice—and really addictive. Very much looking forward to his keynote speech, "The Psychology of Game Design (Everything You Know is Wrong)," on Friday. Peace and iBailout! !, people, and don&apos;t forget that one-stop shop for all your most pressing GDC needs: @marronigames. • CLICK HERE TO SEE MORE COMPLEX VIDEO GAME POSTS!